How does a golf simulator work? Indoor golf simulators may seem awfully complicated for a person that does not have anything to do with modern day technology and its applications. We don’t claim that the way they work is easy to understand, but we are going to try and present you the principles behind modern golf simulators. 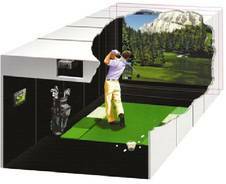 First of all you should know that there are two main technologies that can be used in an advanced indoor golf simulator. The system can either track the ball and its flight after it has been hit or it can track the movement of the club head. In either case, wavelength sensors or cameras are used for this operation that has to be extremely precise in order to offer the player the most realistic experience. All the information that is collected by these sensors is sent to a computer that will calculate the trajectory of the ball by taking in to consideration all the variables like wind or rain. All this happens almost in real time and the player is going to view the projected image of his shot. You will be surprised to see the realism level that has been reached by the latest golf simulators. Not only the movement of the ball, but also the graphics and the sound are extremely real and contribute to the whole feeling.